Summer 2018. The Legacy Collection Millennium Falcon, also known as The Big Millennium Falcon or “BMF” is probably the best vehicle or play set that has ever taken action figure form. It has a great paint job, fun play features including light up engines, high quality sound effects and (my favourite) a ramp that lowers at the touch of a button, accompanied by light. It’s huge, it’s a monster. And it takes up a ton of space in any collection. In Episode 56: Star Wars Summertime I talk about giving this beast a worthy home in my collection as I take my first steps in building a diorama with lights and walls. Now, in my large Rebel base display, the Falcon has it’s own hanger, surround by walls with inset lighting. 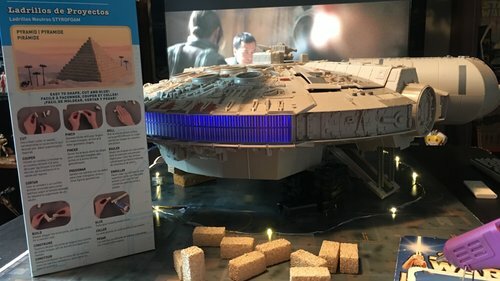 I wish I could have gone even bigger with the diorama as it would have been cool to be able to turn the Falcon around on a turntable in order to see all sides of the ship but as we all know, there’s only so much space in a Star Wars Room. In an upcoming post I’ll have more photos of this diorama, “in action” with Star Wars figures interacting around and in the Millennium Falcon. Click on an image to see a full-size photo slideshow, click the photo to advance. Drag the mouse down to see comments on the photos.